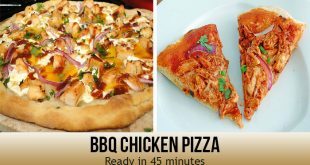 Ready In: 45 min Preparation time: 30 min Ingredients Pre-baked pizza crust 1 (12 инч) Spiced barbeque sauce 1 cup Boneless chicken breast halves, 2 cooked and cubed Chopped fresh cilantro ½ cup Sliced pepperoncini peppers 1 cup Chopped red onion 1 cup Shredded cheese 2 cups Directions Preheat oven to 350 градуса по Фаренхайт (175 градуса по Целзий). Put pizza covering on a medium preparing sheet. Spread the outside layer with barbecue sauce. Beat with chicken, cilantro, pepperoncini peppers, onion, and cheddar. Heat in the preheated oven for 15 минути, or until cheddar is dissolved and bubbly.